A BlackBerry PlayBook Tablet OS update released this morning brings a freshened Facebook app, the ability to make in-app purchases and other minor improvements, but no Android emulator or native e-mail app. The free 312MB update (version 1.0.5.3204) is available via the PlayBook settings menu now, and will be available in the BlackBerry AppWorld app store as well. The revised native Facebook app supports video uploading as well as photo uploads, a rather notable improvement given the high quality of the PlayBook's five-megapixel rear camera, and three-megapixel front-facing webcam. The PlayBook supports 480p, 720p HD and 1080p HD video recording--something the Apple iPad 2 can't do. Facebook friend requests have been separated from other notifications at the upper right of the app and the search function has been redesigned to allow you to search among "Friends," "Everyone" or "Pages." The revised app also adds the ability to delete messages. 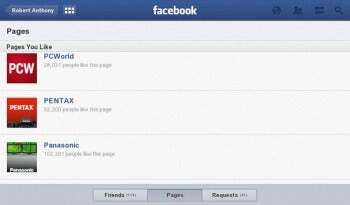 Access to Facebook Pages has been improved with a new bottom-screen "Pages" tab on the "Friends" screen to provide quick access to the Pages of companies, celebrities or any other Facebook Page you've "liked." Other changes include the ability to drop new photos into albums you've already created and the ability to add comments to items in your news feed without leaving the news feed view. Instead of a moving to new page, a dialog window with room for your comment pops up. Within the PlayBook Tablet OS itself, the notification for app updates has improved with more information available from the home screen. 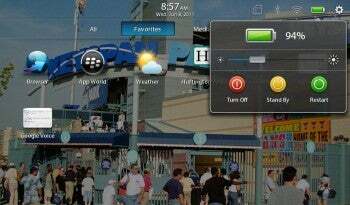 An exclamation point and a number in the upper left corner of the home screen let you know how many app updates are available without the need for opening BlackBerry AppWorld. A click on the exclamation point opens a dialog telling you which of your installed apps have updates. A major improvement for app developers is support for in-app purchasing. For example, a game developer can now sell additional game levels from within his game. New languages are also available, including U.K. English, French, Italian, Dutch, German and Spanish. The PlayBook Tablet OS update address two complaints reviewers, including PCWorld's Melissa J. Perenson, have had about the PlayBook: that it has a hard-to-press on/off button and that the unit has an inability to take a battery charge when powered off. The update includes new functionality to the battery icon and allows the PlayBook to be charged when off. Now, a touch of the battery icon--which appears with a diagonal downward swipe from the upper right corner of the screen--brings up a dialog which not only tells you how much battery power you have left, but also lets you adjust the screen brightness and turn off or restart the unit. This tweak means you can avoid --thus avoiding the power switch. A new warning pops up if you connect the PlayBook to an underpowered microUSB charger like the ones that come with many smartphones. Other enhancements include automatic Wi-Fi hotspot detection, an extra higher volume level for headset use in noisy environments and support for TURN (Traversal Using Relay NAT) protocol, a video protocol which, according to Research in Motion "enhances Video Chat connections between users when their call is crossing between a public network and an enterprise network behind a firewall." While the PlayBook's hardware, especially its high-quality cameras, has been lauded by many reviewers, the lack of native apps comparable to those readily available for iOS and Android tablets still leaves the PlayBook in the role of an also-ran among business-class tablets.